HTTP Security Headers were created to protect applications from frequent and common attacks without the need to add or change the code of your applications. HTTP security headers are designed to restrict modern web browsers from encountering security vulnerabilities. Below you will find an HTTP response headers related to security and how to add security headers to your WordPress site. Do you know which security headers need improvement on your site? HTTP Strict Transport Security (HSTS) allows web servers to declare that web browsers (or other complying user agents) should only interact with it using secure HTTPS connections, and never via the insecure HTTP protocol. max-age parameter will set the time, in seconds, for the browser to remember that this site is only to be accessed using HTTPS. includeSubDomains is additional parameter which can be used to apply this rule to all of the site’s subdomains as well. You can add HSTS security header to WordPress site by adding few lines of code to Apache .htaccess file or to nginx.conf file. You can see the snippets for both server type below. X-Frame-Options protects visitors against Clickjacking attacks. Using iframe, the content of your site could be loaded inside another website. This could be abused maliciously when visitors click on a link they believe to be harmless when actually they’re navigating inside your website. This can be highly dangerous when the user has previously logged in to a restricted area on your site. deny parameter will completely deny rendering within iframe. sameorigin parameter will deny rendering if origin mismatches. You can add X-Frame-Options security header to your WordPress site by configuring the .htaccess file (Apache). With NGINX you need to edit nginx.conf file. X-XSS-Protection security header allows you to configure the XSS protection mechanism found in popular web-browsers. As an example, this could prevent session cookie stealing with persistent XSS attack when a logged in visitor is visiting a page with XSS payload. 0 parameter disables the filter. 1 parameter enables the filter. 1; mode=block enables the filter with the 1 parameter and additionally blocks the website to be rendered with mode=block. 1; report=https://your-report-url/ enables the filter with the 1 parameter, then sanitizes the request and sends report to the selected url with report= parameter. You can add X-XSS-Protection security header to your WordPress site by configuring the .htaccess file (Apache). With NGINX you need to edit nginx.conf file. You can add X-Content-Type-Options security header to your WordPress site by configuring the .htaccess file (Apache). With NGINX you need to edit nginx.conf file. 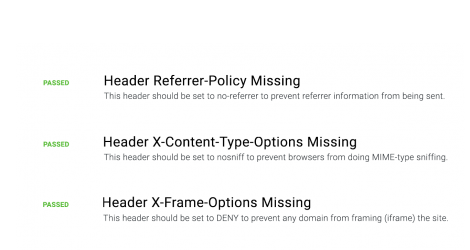 Content Security Policy header helps you reduce XSS risks on modern browsers by declaring, which dynamic resources are allowed to load. 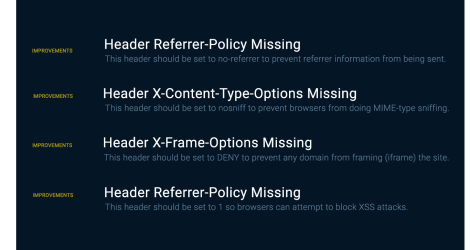 Similarly to X-Content-Type-Options, Content-Security-Policy header has a lot of configuration options and potential parameters, but at this point, we will mention the ones in the example (which is recommended for beginners). connect-src parameter applies to XMLHttpRequest (AJAX), WebSocket or EventSource. If not allowed the browser emulates a 400 HTTP status code. img-src parameter defines valid sources of images. style-src parameter Defines valid sources of stylesheets. You can add Content-Security-Policy security header to your WordPress site by configuring the .htaccess file (Apache). With NGINX you need to edit nginx.conf file.